Francesca Hayward as Manon and Alexander Campbell as Lescaut in Manon, The Royal Ballet © ROH, 2018. Photographed by Bill Cooper. Claire Calvert as Lescaut's Mistress in Manon, The Royal Ballet © ROH, 2018. Photographed by Bill Cooper. 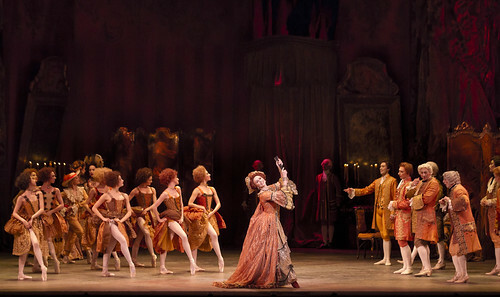 Francesca Hayward as Manon, Christopher Saunders as Monsieur G.M. and Alexander Campbell as Lescaut in MacMillan's Manon © ROH 2018. Photograph by Bill Cooper. There are currently no scheduled performances of Manon. It was last on stage 29 March—16 May 2018 as part of the Spring 2017/18 season.